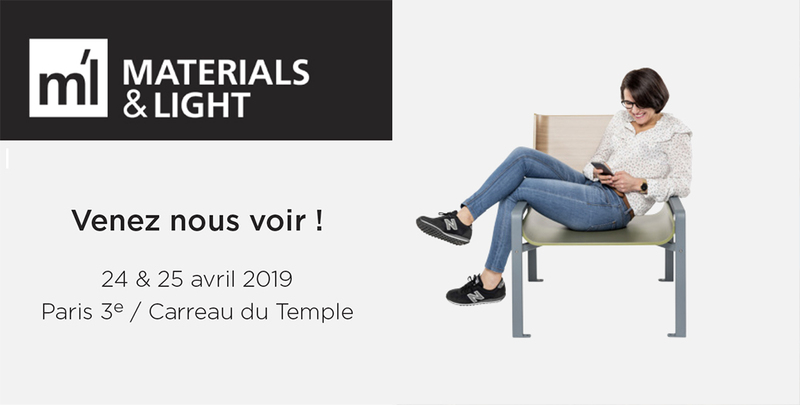 On the occasion of the 5th edition of the Materials & Light exhibition, Aubrilam will be glad to introduce its range of furniture on April 24 and 25, 2019 at the Carreau du Temple. The Materials & Light exhibition, organized by the d’a magazine, has become a reference in the field of innovative products, materials, lightings and interior design for Professional. This year, 60 exhibitors will share 2 000 sqm of exhibition hall, including Aubrilam. / Ido, our bench created by Anna Szonyi that looks like a real urban sculpture. We will also have the opportunity to present our newest tint, “La Mer”. Its brushed aspect brings to wood the aging effects of winds, currents and tides. We look forward to see many of you at the Materials & Light exhibition !